The European Union is on the brink of handing even more power to a handful of giant American tech companies, in exchange for a temporary profit-sharing arrangements with a handful of giant European entertainment companies — at the expense of mass censorship and an even weaker bargaining position for working European artists. In both cases, the EU proposals may result in some small transfers from America’s Big Tech companies to Europe’s copyright industries — German newspaper families, the EU divisions of global record labels — but at a terrible cost. Take Article 11: the rule allows newspapers to decide who can link to them, and to charge whatever they think the market can bear for those links. While it’s unlikely that Europe’s news giants will forbid each other from linking to their articles, the same can’t be said for the established news giants and the upstart, critical press. Small, independent press outlets can be blocked altogether from linking to established news sources — even for the purposes of criticism and commentary — or they could be charged much more than their counterparts in the mainstream. And while Google and Facebook will regret the loss of a few million euros they will have to pay the major news services, it’s nothing compared the long-run benefit of tech giants never having to worry about a Made-in-the-EU upstart growing to challenge them. These little guys don’t have the millions to spend that US Big Tech does. Article 13 is even worse. Though the current draft says that “filters are to be avoided,” it also is designed to guarantee that filters will be required. The past three months have been spent adding a laundry-list of impenetrable, contradictory, incoherent clauses insisting that some theoretically perfect technology to filter hundreds of billions of communications and sort them into “infringing” and “not infringing” is can be legislated into existence (it can’t). It’s not too late: the European Council — made up of representatives from EU member states like Sweden — will soon vote on the Directive. Their decision will shape future of the Internet, possibly for generations to come. 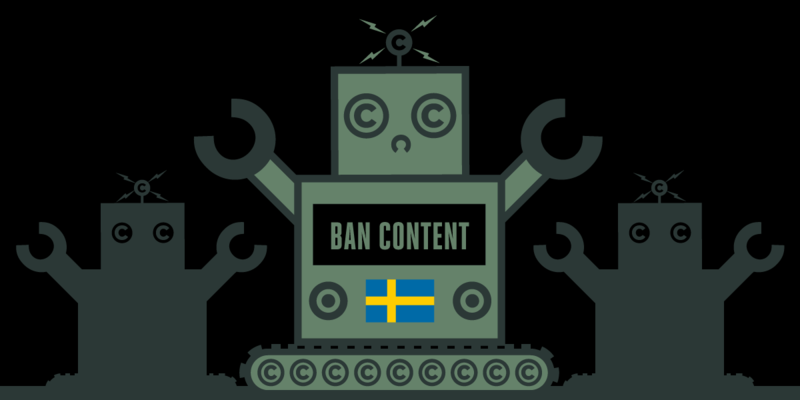 We need Swedes to act, to tell their representatives to strike a blow for fairness and against market concentration and censorship.